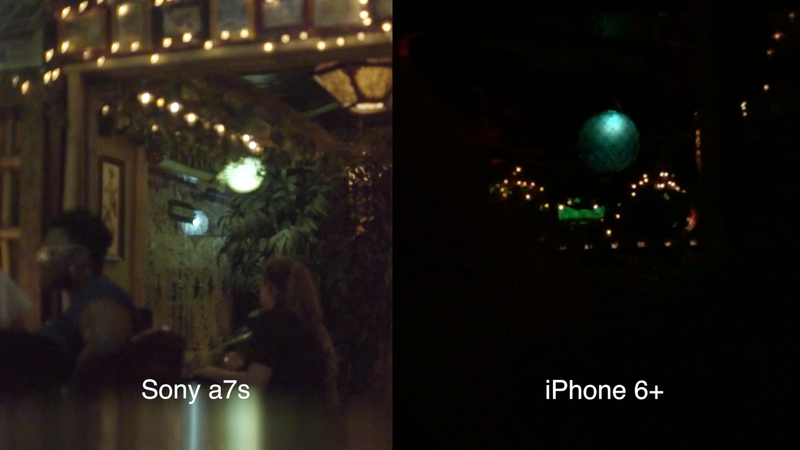 Is the Sony a7s worth the low light hype? I recently picked up the a7s as an upgrade as like most people, got tired of waiting for canon to release something new and since i shoot primarily in low light or night settings I’ve been interested in the a7s for a while. But its easy to get wrapped up in the hype. Things I really wanted such as internal 4k like the gh4 were a pretty big trade off but being able to “upgrade” to 4k with a external recorder is something to worth noting. I’m in the process of putting together a test video but since i’ve inly had the camera a couple days I thought an initial test was worth looking at. Here a still from the camera and an iphone6+. I Love shooting with my iPhone because its so quick and easy but for production it get a little noisy. Anyway- theres a bar in Milwaukee called the Foundation. its a tiki bar that is known to be almost in total and complete darkness. It could be 1am or 1pm and its like you’ve walked into a room with almost night lighting save from a few puffer fish lamps. So heres my first test shot. Im working on another tester that I will share as soon as its complete.